Sony has finally spilled the beans on how it will let existing PlayStation Portable players with existing UMD collections onto the PlayStation Vita. 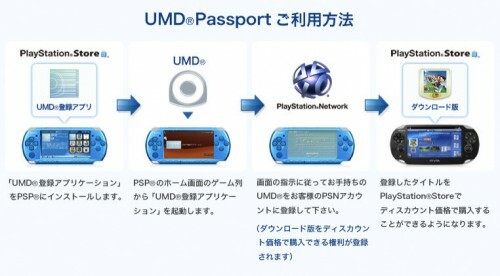 The company is calling this program the UMD Passport and while it ensure that you’ll be able to play your current game library on the upcoming portable console, there is one slight catch, you will have to buy them again for the Vita. Nevermind that you’ll be able to get the download version of your PlayStation Portable games for your PSN account, or that you’ll be able to buy them at discounted prices. You will still have to buy them again :/. Boot up the UMD Registration Application from your PSP’s XMB menu and insert the UMD game you want to register into the system. You can then download the downloadable version of your game at discount price. The program will initially supports around 200 titles from 40 companies for the Japanese Vita release with little doubt that more will be added when the Vita hits international market. The current list is available here: here. Pricing for current titles are around around the 500 yen to 1500 yen, including several major titles like Gran Turismo, Persona 3, Phantom Kingdom, and Akiba’s Trip. Once registered and bought, the PSN version of your UMD games can be downloaded directly onto your Vita or thru the PlayStation 3 and transferred to the new console (ala PlayStation Portable). The UMD Passport will be available on the Japanese PS Store on December 6. No word on when the app will hit other PS Store regions. Lastly, a bit of warning, since the PSN version of the UMD titles will be downloaded after Sony implements the new two-system activation for PSN content, the restrictions apply. Basically if you have content that can be shared on the PlayStation 3, the PlayStation Portable and the PlayStation Vita, you can’t have it on all three devices.